I was at a travel clinic recently, and I was shocked by the number of posters on the wall advertising for vaccines, telling me all the horrible diseases I was going to get just for stepping outside of my door (or my continent, as it were). I’m glad I’m not a hypochondriac, but I can see becoming one if I spent too long with these materials. On a nicer note, does anyone notice a couple of familiar faces in the posters :)? When I was drawing this comic I thought to myself “heh, wouldn’t it be cool if I got Bearman in there for that charity challenge of his?” I think I’m just barely getting it in based on his recent updates, but still, happy to feature that crazy, green haired dude in this strip regardless. I have been waiting years for someone to give me an honorary degree. Finally I can tell my mother that I am a doctor. Thanks B for the charity shout out! You and your mom can be so proud, Bearman! Your mother and I are very proud of you. I guess we can contact you for medical advice now, right? Hahaha! I love seeing Dr. Procotr and Dr. Bearman together. I’ve always suspected that Doc would pimp himself out for whatever her could. Thank you so much for including him! Doc takes after his creator. Hey, you know me. It’s all about the Washingtons, baby! Our pleasure! These seem like his kind of scare tactics :). Doctor’s visit may cause nausea,constipation, bloating, anxiety, and death. Please consult with your doctor before going to the… waaaaaitaminute. Dr’s in tha hood. Nice feature. Proctor is such a mean Doctor! He’s get me all curled up in fear too, I bet. Grab your cheque book! He’ll be your best friend, I’m sure :). Those posters would make a hype-ochondriac out of anybody! Love the Bearman and Dr. Provoc appearances, they fit right in there very nicely! Thanks Mark! Don’t believe the hype ;). Love the cameos from Bearman and Addanac. I think there’s a happy middle :). I’m not sure I could trust a poster that quotes Doc Proc! I feel like as long as it financially benefits him, you can trust him. Ha! Having just visited the doctor recently, I fully agree. No one needs to see that many poster and pamphlets about diseases. 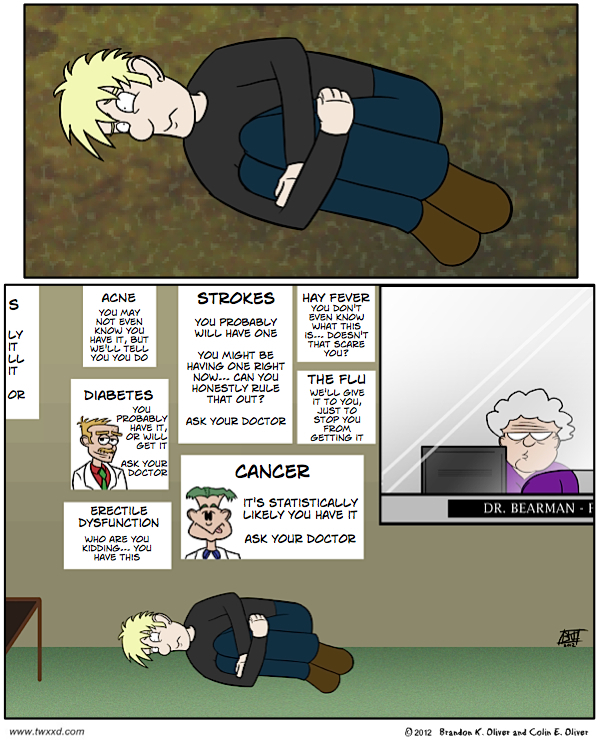 I think the internet has created a whole army of hypochondriacs. But this is hilariously true! Yeeeeeah, heaven help you if you decide to google a symptom you’re having lol.